The legend of David Ortiz is ending, but is one more title necessary? Ortiz belted his historic 500th career home run during the 2015 campaign (Max Wildstein/WEBN). When this season is done, whenever that might be, we are all going to miss David Ortiz. It’s strange how we’ve come to this point, really. Part of that is because once upon a time, David Ortiz wasn’t exactly a name to get excited over. He was a no-name player who came up through the Seattle Mariners’ farm system and was on-again-off-again with the Minnesota Twins. Then he signed with the Boston Red Sox, and the rest of the story writes itself. To say that Ortiz was a huge signing for Boston is a frontrunner for Understatement of the Century. The man we know and love as Big Papi was a game-changer in more ways than one. He was a home run machine, a Yankee killer, and an x-factor all rolled into one giant-sized package. People can, and likely will, go on for days talking about how clutch Ortiz has been for the Red Sox. Whether it was a hot summer night in June, or the beginning of the most stunning October comeback ever, Ortiz stepped up when no other answers seemed possible. And the man was no slouch when it came to personality, either. Behind that tall, imposing exterior is a man whose charisma matches his stature. Ortiz is a man who lives life passionately, both on the field and off it. Just as the city of Boston loves him, he loves Boston. Heck, this is the same man who proudly proclaimed that Boston “was our [bleep]ing city, and nobody is gonna dictate our freedom” following the Boston Marathon bombings. Even the FCC of all organizations was totally fine with Ortiz dropping an F-bomb. Ortiz has done so much for the Red Sox and the city of Boston in general over the past fourteen years. He’s been there through good times and bad, basically the whole experience. To know that a man of that caliber is leaving the team at season’s end is a disappointing thought. Everyone wants the Red Sox to win the World Series this year to send Ortiz off on a high note. That would be an amazing thing to see, but to be honest, I won’t be upset if it doesn’t happen. If Derek Jeter can retire without one more shot at the World Series, there’s no shame in Ortiz possibly going down the same road. Besides, Ortiz has given Red Sox fans everything they ever wanted, and so much more. The way I see it, Ortiz doesn’t necessarily need to win one more title; he already has three rings, so his spot in Cooperstown is as good as reserved. 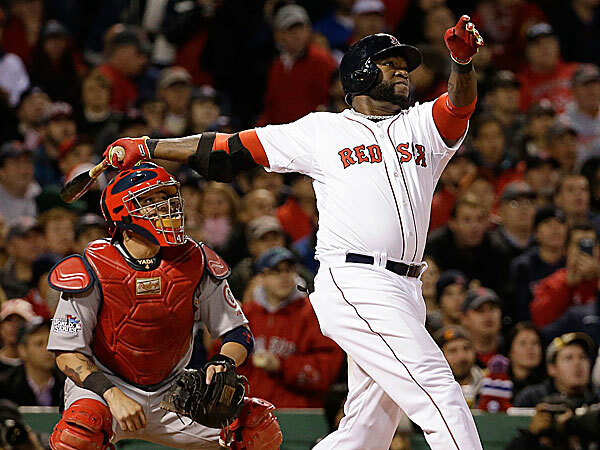 Would a World Series win be icing on the cake for Ortiz? Absolutely. But when you think about it, this cake is already pretty decadent. But that’s all talk for later in the season. For now, let’s sit back, relax, and get ready for one more season of Big Papi and friends.